Of all the Napa Valley wine tours, there is one that stands as one of the most unique in the entire state. 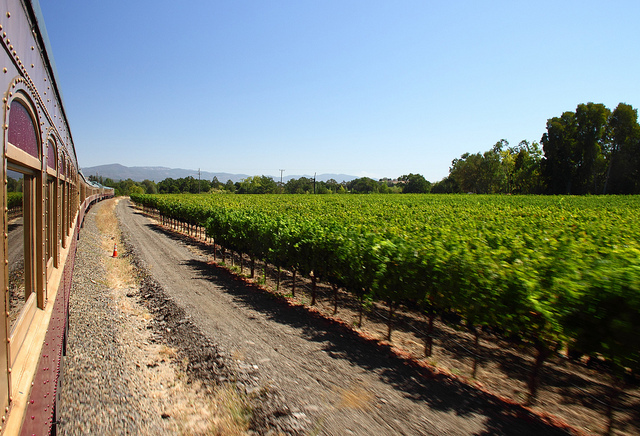 The Napa Valley Wine Train is a one-of-a-kind experience that takes guests on a journey by rail through the heart of the land aboard a vintage rail car. It is a memory-making adventure that allows you to experience California’s famous wine capital in a unique and luxurious way. The Napa Valley Wine Train offers several adventures for guests to choose from including fine dining aboard the train, winery tours, and will even cater to private events such as weddings and corporate meetings. Guests will feel as if they have been transported through time when they step into a museum quality train coach that has been fully restored to reflect what luxury train travel was like during the early 1900s. During your journey, you will be served a fresh multiple course meal that was prepared just for you by talented chefs aboard the train. If you have any dietary restrictions or allergies, have no fear. 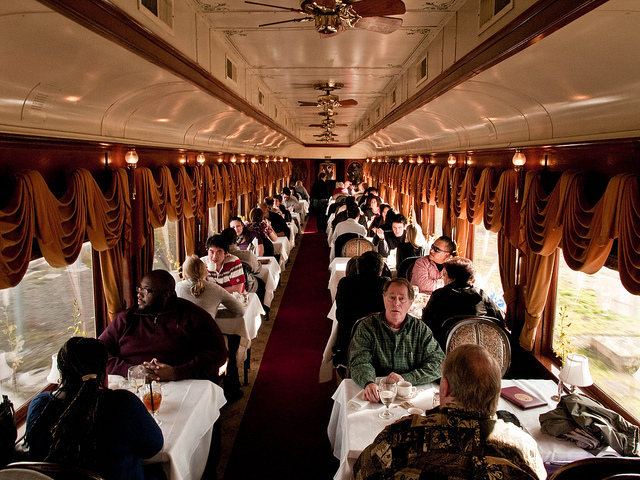 The Napa Valley Wine Train will gladly accommodate your meal to your needs so you can enjoy your on board adventure with ease. Vista Dome: Providing the most private of the dining experiences, guests will enjoy fine cuisine within a two-story rail car modeled just like a 1952 Pullman. The journey includes a multiple course gourmet meal, a glass of sparkling wine, and a three-hour ride around Napa Valley. Sunset Trains: Departing just as the sun is beginning to bathe the valley in waning orange light, this journey serves up a gourmet meal, a taste of wine, and gorgeous views of the Napa Valley Sunset. Murder Mystery: Whodunnit? This theatrical dinner show puts you right in the middle of the action as you help to solve the mystery over dinner and wine. The Castle Winery Tour: Tour one of the icons of Napa Valley, Castello di Amorosa, and enjoy a gourmet lunch and a 1.5-hour tour around the vineyards as well. Grgich Hills Winery Tour: As our longest running winery trip, this is one to do if you love history and wine. Learn how the founder of this historic winery helped put Napa Valley on the map while sampling his organic wines. As each journey is unique, prices vary according to which adventure you choose to embark. Dining journey prices range from $129 to $234 per person while the train and winery tours run from $189 to $249 per person. The tasty food, wine fresh from the Napa Valley, and overall experience make the journey worth every penny. After exploring the world-class vineyards, come “home” to Churchill Manor, a bed and breakfast surrounded by 19th-century charm and an opulent atmosphere. Conveniently located just a block away from Downtown Napa, you’ll never be too far from all there is to experience. Take your pick of our beautifully crafted guestrooms or delightful vacation packages. We can’t wait to see you in Napa Valley soon!